Another homeschool convention checked off our list for the Spring this past weekend, and we have one left the end of this month in Cincinnati. We did our local Kansas City convention, and I surprised myself when I told Sean I would just stay home on Saturday with the two youngest girls. I LOVE going to conventions, but it just felt like a better use of my time, and I’m so glad I did because Emily ended up getting a 102 degree fever all afternoon and was so fussy! I think it’s just from teething, her front two teeth are coming through and she is doing better today. Some of you might laugh, I spent less than $20 the whole weekend at the convention! I bought some tracing paper for the older ones, and a pencil grip for Sophia, then two old history books that looked interesting for the children to read. That’s it! I’m planning on doing any serious shopping in Cincinnati, so I tried to not buy much this time. This is the only photo I have to share this week (I took outfit photos and went to put them up and realized they didn’t turn out!). I fixed Carrianna’s hair Sunday morning, literally 2 minutes before they left to go to church (I stayed home with sick children). This stye was so simple but I loved how pretty it turned out! I used an XL flexi clip as she has super thick hair. This is a retired Flexi of the Month, so it’s not available now. Make sure you grab those Flexi of the Month clips right at the beginning of the month, as April sold out right away! 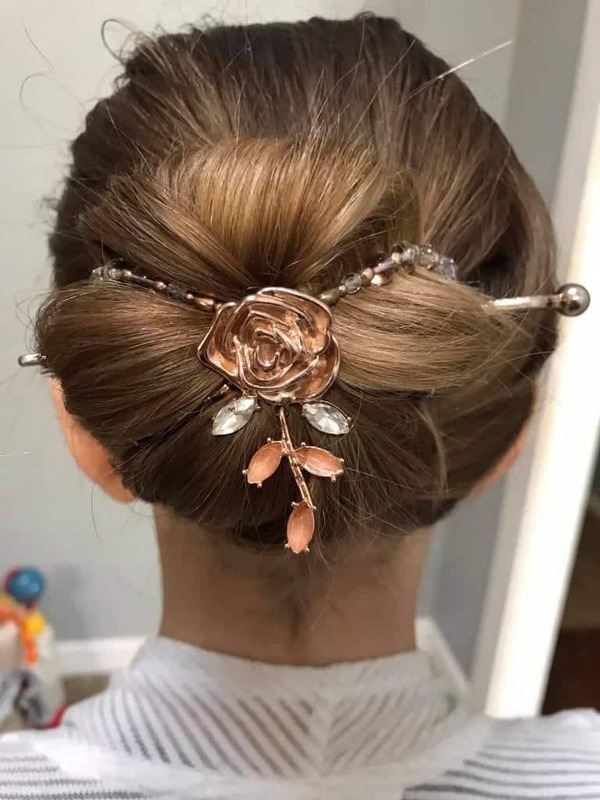 I had requests to go live and share exactly how we did this hairstyle, so watch for that later this week on my Facebook page! Carrianna’s hair looks lovely! Thanks for hosting and have a great week! That clip is so elegant! Sorry for sick kiddos, what a blessing you stayed home though. Thank you for the link-up party!